May 29, 2017: NeoPixels... They totally worked... Now they don't... Help? Jul 16, 2017: 12V LED power supply for 5V LED strips? Jul 25, 2017: Anyone have experience with the fastled library? Aug 27, 2017: Is this LED Strip Setup going to work? Aug 27, 2017: Is this LED Strip set up going to work? Nov 12, 2017: Panel mount JST SM connector? Mar 12, 2018: Looking for some addressable LEDs that will work with my motherboard. Any help appreciated. 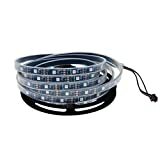 Jul 16, 2018: Am I going to start a fire with this LED strip wiring? Oct 27, 2018: Why won’t this 3 pin led strip fit in my RGB header in my motherboard. Just for fun I also tried to fit it into my 3 pin fan headers to see if it would fit and it wouldn’t either...? Jan 28, 2019: How to mount LED strips to walls/ceiling without damaging the paint when I remove it?